HOUSTON (Reuters) - A petrochemical disaster outside Houston that has disrupted ship traffic for days at a major U.S. oil port led two major refineries on Monday to reduce fuel production, according to people familiar with the matter. 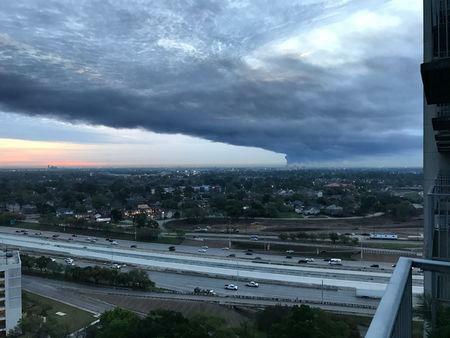 A fire and fuel leak at Mitsui & Co Inc's Intercontinental Terminals Co storage facility in Deer Park, Texas, last week sent gasoline, water and fire suppressant foam into the Houston Ship Channel, a waterway that connects Houston to the Gulf of Mexico. Officials on Friday closed a seven-mile stretch of the channel after chemicals, including benzene, were detected in the water. That shutdown has caused a bottleneck of tankers unable to enter or exit a busy area of the Houston port. On Monday, Royal Dutch Shell Plc and LyondellBasell Industries cut production at their oil refineries on the waterway, according to people familiar with their operations. Shell reduced output at its 275,000 barrels per day Deer Park, Texas, joint-venture refinery with Mexico's Pemex because of a shortage of crude, the people said. The size of the reduction could not immediately be learned. Lyondell reduced its output by 14 percent because it cannot remove sulfur generated at the plant during fuels production and has limited storage capacity on site, the people said. Some of the Shell Deer Park plant's processing units are on circulation, a standby process that halts production but keeps unit at operating temperatures allowing a quick return to production, the people said. Shell's operations at Deer Park were stable, said spokesman Ray Fisher. The plant is near the ITC storage terminal that caught fire more than a week ago, releasing chemicals into the air and local waterways. Shell last week instituted a temporary shelter-in-place for workers after air monitors detected elevated levels of benzene. On Monday, 31 vessels were waiting to enter the busiest U.S. oil port and another 31 were unable to depart, said Coast Guard Supervisor Ashley Dumont, up from 26 each on Sunday morning. "We are experiencing constrained barge and vessel logistics capabilities," said Lyondell spokeswoman Chevalier Gray. "We are currently evaluating the impact of this event on our production and logistics capabilities." The Coast Guard reopened the San Jacinto River, which connects to the Houston Ship Channel, to allow two-way vessel traffic for three hours until 12 p.m. CDT (1700 GMT)on Monday. It could not say when the entire channel could reopen to traffic, Dumont said. As long as crews are working to remove fuel and chemicals in the industrial waterway, traffic will move only during daylight hours, Coast Guard Captain Kevin Oditt said at a morning briefing. The oil market's reaction to the ship channel closure has been muted, with Houston crude prices "slightly weaker" because vessel traffic was expected to resume soon, traders said. West Texas Intermediate crude at Magellan East Houston for April delivery, also called MEH, traded at a $5.85 per barrel premium to U.S. crude futures in early trade, down from a $6.10 midpoint on Friday, traders said.